The following poems are part of a collection that is still looking for a publisher, featuring some of Hungary’s most prominent contemporary female poets, and compiled by Eszter Krakkó and Diána Vonnák. 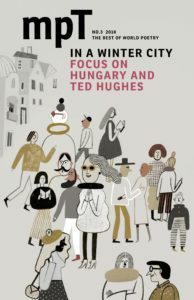 Diverse yet bearing important affinities, the poems in the collection (almost fifty) offer insights into life in Hungary today from the perspectives of women in Central Europe in the fi rst two decades of the new millennium. The poems of Mónika Mesterházi offer an intimacy that dwells in a double-wrapped core: narrative mixed into meditation, often followed by a moment of supreme clarity that sets a poem into a larger human context, almost like a sonnet’s closing couplet. The four poems presented here can be taken as consistent examples of this approach. Her narratives, and the messages they convey, are revelatory, not didactic. Indeed this is the difference between great poetry and cliché, and explains why her poems feel so firmly a part of the greater Euro-American tradition. The peasant river was untempted by the fashionable quays. the wild geese now were coming home. Here, in contrast to Auden, Mesterhazi exposes an even more brutal truth: nature is not merely indifferent, but seems to ignore human trauma as it resettles into its familiar ways, ultimately obscuring both the victims of violence and the feelings of those who choose to remember them. This is the poetry of feelings without sentimentality, of human experience amid inhuman forces.